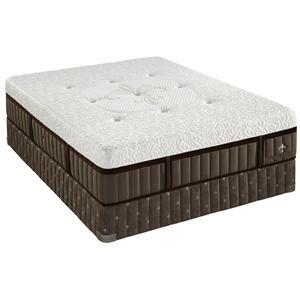 Sleep in luxurious comfort with this Firm Euro Pillow Top mattress. 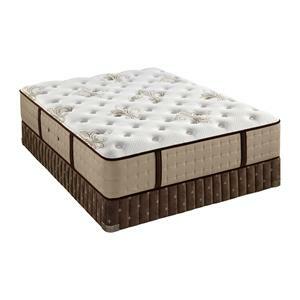 With the soft cushion of the euro top and firm support, this mattress is a great fit for back or side sleepers. Layers of high density foam enhance the durability of the mattress, with a layer of memory foam that provides conforming comfort as it shapes to your body. 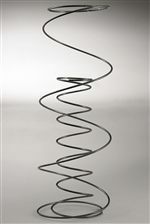 The Intellicoil iD titanium innerspring system features a unique two-in-one coil design which is individually wrapped to give you deep-down support and comfort. A foam encased edge system creates a firmer, more substantial sitting and sleeping edge. This mattress also includes an exclusive Indulge Quilt with tension-relieving foams that will cradle you in complete comfort for a luxurious night’s sleep. The Estate 2012 Full Luxury Firm Euro Pillow Top Mattress and Box Spring by Stearns & Foster at Adcock Furniture in the Athens, Bogart, Watkinsville, Lawerenceville, Gainesville, Georgia area. Product availability may vary. Contact us for the most current availability on this product. 624084F Full High Profile Foundation with Brown Cover 1 9"
FEPT F Full Luxury Firm EPT Mattress 1 14"
Top Quilted with 1" Ultra Soft, .5 oz Fiber, 1" Hypersoft. The soft, cashmere-infused cover regulates body temperature and gets softer with age. Coils and Support Individually Wrapped Titanium Alloy Intellicoil iD is a unique coil-in-a-coil design that delivers deep-down support and comfort. Mattress also features 1" Marvelux base insulator. Edge Support 2.5" Foam Encased Edge System provides substantial support for a comfortable sitting and sleeping edge. Foundation/Box Spring Limited Deflection (LTD) Box Spring is designed for enduring stability. Fire Barrier Information FlameGuard Fiber provides protection from fire. Note: Mattresses manufactured for sale in Canada are not required by law to have fire barriers. Sweet dreams await you with a mattress from the Stearns & Foster Estate Collection. The soft cashmere-infused cover offers a luxurious feel and regulates body temperature, helping you stay cool in the summer and warm in the winter. Within the mattress, high-density, furniture-grade upholstery foams ensure durability. 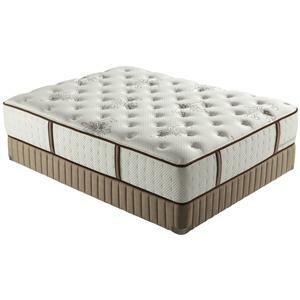 The Estate Collection offers the enveloping quality of memory foam or luxury latex foam to give you conforming comfort while you sleep. Featuring a unique coil-in-a-coil design, the individually wrapped Intellicoil iD with titanium alloy is designed to deliver the ultimate combination of comfort and deep-down support. With a range of surface feels and comfort levels to choose from, give yourself a restful night’s sleep every night with a mattress from the Estate Collection. All Stearns & Foster models, with the exception of those with an Ultra Firm construction, are designed to work on an adjustable base for personalized comfort and convenience. The Estate 2012 collection is a great option if you are looking for Mattresses in the Athens, Bogart, Watkinsville, Lawerenceville, Gainesville, Georgia area. Browse other items in the Estate 2012 collection from Adcock Furniture in the Athens, Bogart, Watkinsville, Lawerenceville, Gainesville, Georgia area.